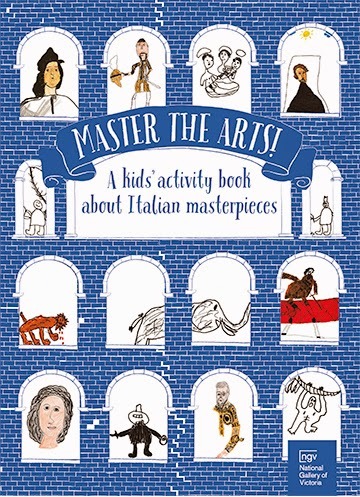 Fully illustrated in colour by Melbourne artist Tim Fleming and published to coincide with the Prado’s Collection at the National Gallery of Victoria in Melbourne, this interesting activity book covers eight Italian masterpieces. Works included are by Andrea di Lione, Raphael, Codazzi, Tiepolo, Tintoretto,Titian, Mario Nuzzi, Ligozzi, and Vanvitelli. Full of wonderful information it encourages children to discover and learn while engaging in the countless activities. It includes fun games, art to complete and challenges. This will awaken an interest in the famous Masters and their work, how they went about it, and what was involved in becoming an artist. The book is made up of many parts which include the role of an artist’s apprentice and his duties, and how they made and mixed pigments using strange, sometimes disgusting ingredients. There is a section on the gods and goddesses of Ancient Greece and Rome, and one on the plague. It highlights the Colosseum and what it meant to be a gladiator. Ideal for the 6+ age group, both boys and girls are encouraged to use their imagination, creativity and challenge themselves with painting and drawing like the Masters. The exhibition is called Melbourne Winter Masterpieces: Italian Masterpieces from Spain’s Royal Court, Museo Del Prado and will be showing from the 16 May – 31 August 2014.